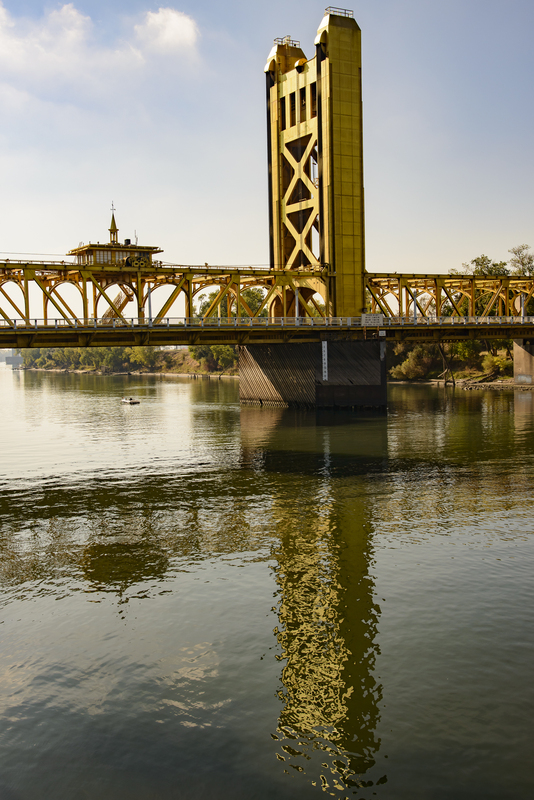 Wednesday, I had lunch with two of my cousins who drove over from the Bay Area to join me at the Rio City Café in Old Sacramento on the Sacramento River. The day was a gorgeous sunny day, although a bit nippy out on the patio overlooking the river, but we enjoyed a delightful lunch with lively conversation. From our table, I could see the landing where I did the “save the date” engagement shoot a couple of weeks ago and in the background, the Tower Bridge. I featured the Tower Bridge, lit up at night here. While I was waiting for Penny and Lynda to arrive, I took a couple of shots of the bridge from that landing. Then, just before our lunch was served, the tall ship Hawaiian Chieftain embarked with a load of passengers on a sight seeing excursion. 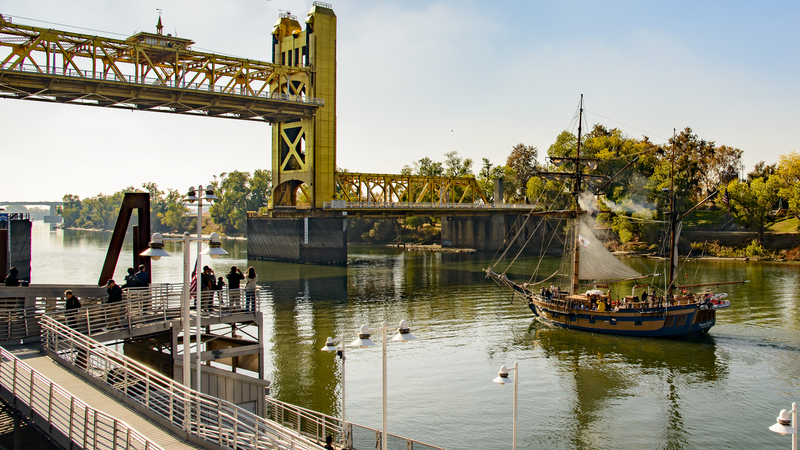 Because the Hawaiian Chieftain is a tall ship, the Tower Bridge, which is a vertical lift bridge, lifted up to allow the Chieftain to pass beneath it. The first shot shows the bridge in its usual position to allow vehicle traffic into Sacramento from Yolo County and out again. Capitol Mall connects the Tower Bridge with the State Capitol Building, ten blocks east. In the second shot, the bridge is elevated with the Hawaiian Chieftain approaching. 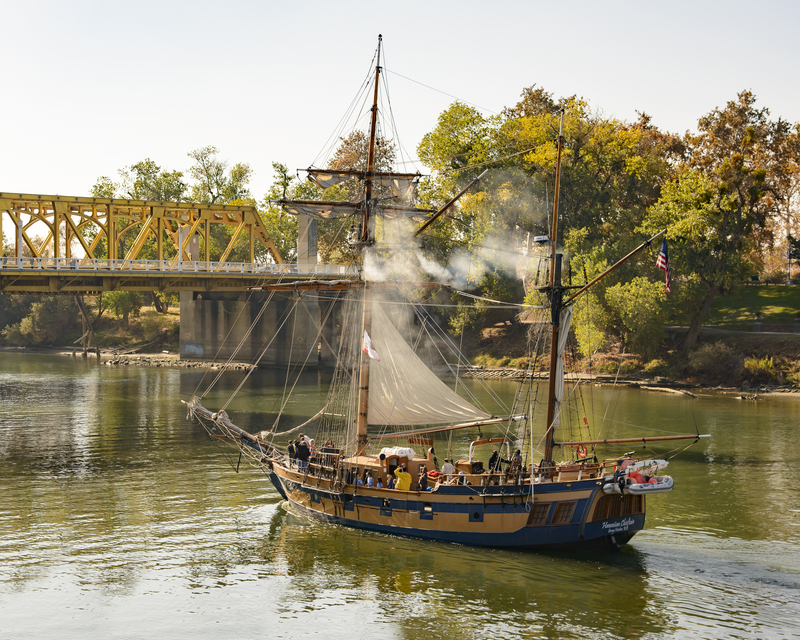 The third shot is the Hawaiian Chieftain just before it passed under the bridge. This entry was posted on November 13, 2015 by Carol Smith. It was filed under Uncategorized .